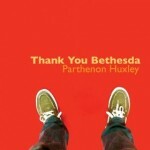 Share the post "Album review: PARTHENON HUXLEY – Thank You Bethesda"
Parthenon Huxley is fine purveyor of pop rock tunes and over here in the UK maybe best known as the guitarist in The Orchestra, the band that features former ELO members (one of these, Eric Troyer helps out on vocal arrangements on ‘Love Is The Greatest Thing’). His long time drummer Gordon Townsend is also a member of The Orchestra too. Another album made possible by a successful kickstarter campaign with those fans pledging more getting their picture in the credits, a nice touch. What I love about the songs on here is the vocals of Parthenon, gentle and melodic, coupled with choruses made for radio if only the mainstream radio stations would open their ears. I defy anyone not to like ‘Love Is The Greatest Thing’, from the guitar solos through to the gospel/Beatles approved vocal arrangements this sort of tune makes you glad to be music lover. Again the vocal arrangement on the fade out is like musical bliss to the listener’s ears. Pop rock doesn’t get much better than ‘Angeleno’, a wry look at the West Coast music and film industry. For quieter moments look no further than ‘Turn The Soil’, with a slower melody an interesting diversion musically. He also revisits one of his older tunes ‘Buddha, Buddha’ here on the album with noodles or noodle-free. Simple folks, if you love finely crafted pop rock and have albums by Cheap Trick, Jackdaw4, the Beatles and/or Glen Burtnick in your collection then this is a ‘must have’. This entry was posted in ALBUM REVIEWS, ALBUM REVIEWS (Mobile), All Posts and tagged album, Cheap Trick, ELO, Eric Troyer, Gordon Townsend, PARTHENON HUXLEY, pop, review, rock, singer, songwriter, Thank You Bethesda, The Orchestra. Bookmark the permalink.